Once you have located your deleted documents with the download version, purchase a registration key to activate the save files feature. You must save the files to a drive other than the one on which they were lost. 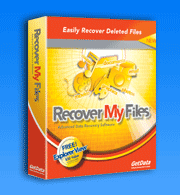 Recover My Files requires no special technical skill. It is compatible with all versions of Windows and FAT 12, FAT 16, FAT 32 and NTFS file-systems. Use Recover My Files to undelete and recover files from Jaz, Zip disk, USB drives and other removable media types, as well as hard disks and floppy disks.